NAMA acquired more than 12,000 loans in a range of currencies which had been advanced to over 5,000 debtors (managed as 780 debtor connections by NAMA). The acquired loans were secured by more than 10,000 groups of properties across a range of asset classes and markets (these were further disaggregated into over 60,000 saleable property units). At end-2013, the largest 217 debtor connections (generally those with par debt in excess of €75m) accounted for €55 billion of current part debt. The other 563 debtor connections accounted for €12 billion of current par debt and is managed by the Participating Institutions ('PIs'): Allied Irish Bank p.l.c. ('AIB'), Bank of Ireland ('BOI') and Capita Asset Services ('Capita' or 'Primary Servicer' or 'Master Servicer'). 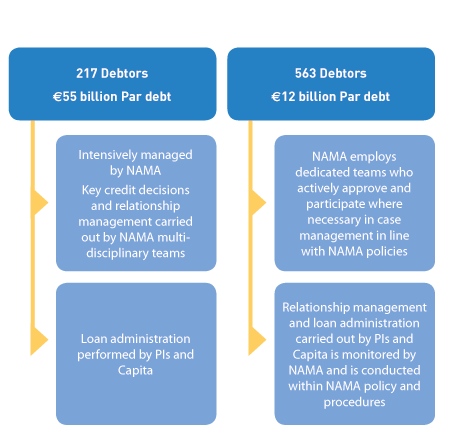 NAMA's approach to debtor management is outlined in the chart. As part of NAMA's initial engagement with debtors, each debtor connection was required to undertake a comprehensive business plan process designed to assess commercial viability and its willingness to co-operate with NAMA. Business plan engagement with debtors involved the assessment of 780 debtor business plans. This was completed by end-June 2012 and, based on these assessments, strategies were adopted by NAMA towards each of the debtor connections. Debtor strategies are designed to deal expeditiously with acquired assets and to protect or otherwise enhance their value. In seeking to fulfil this objective, NAMA has engaged extensively with debtors, Receivers and with the PIs and is focused on optimising the recoverable value of assets. Day-to-day management of debtor strategies involves credit decisions, monitoring and reporting. Formal reviews of debtor connections, known as Strategic Credit Reviews, are also undertaken on an ongoing basis. From inception to end-2013, NAMA made a total of 39,686 credit decisions, including 17,886 in 2013. The average turnaround time for credit decisions in 2013 was less than 5 days and the approval rate was 95%. Credit decisions vary in complexity and include debtor strategy reviews, new lending, enforcement action, asset and loan sales and asset management decisions. A major feature of the credit decision process is the review and approval of new rental arrangements and, from inception, NAMA has approved nearly 4,000 new leases with over 1,400 of these approved in 2013. Table 1 below outlines the number and value of approved credit decisions relating to asset sales and new capital advances from inception to date. Typically, debtor strategies tend to fall into four broad categories: (1) Restructure, (2) Consensual workout, (3) Asset/Loan Sales and (4) Non-Consensual. Table 2 below summarises the extent to which each strategy has been adopted to date. NAMA's preferred approach is to work consensually with debtors where possible and it has worked with the majority of its debtors on that basis to date. Where a consensual approach is not possible and loans are in default, enforcement proceedings are initiated. A consensual approach means that debtors manage the agreed property and realisation strategy, under close monitoring by NAMA, with suitably reduced overheads adapted to the level of activity envisaged. The agreed asset management and disposal strategy will typically include some or all of the features outlined on the below. Schedules of agreed asset/portfolio sales with the timing of particular sales dependent on the type of property involved (for example, residential investment, commercial investment, land), the jurisdiction and location of the property and the scheduled expiry of any associated leases. Reversal of any transfers, which may have taken place over recent years, of assets to related parties (for example, spouses and other family members), including property, cash, shares and other gifts. €180m has been recovered by NAMA to date. NAMA's policy is to seek charges over unencumbered assets as additional security, taking account of the transaction costs and any legal issues involved. Where another lender has security on a debtor's assets and in order to capture future upside potential, NAMA takes second charges over surplus equity where appropriate. From inception to end-2013, NAMA had obtained charges over additional security with an aggregate value of over €800m including €180m of asset transfer reversals. Additional security is identified in a number of ways. NAMA's Asset Search team is responsible for managing the implementation of asset searches designed to verify debtors' asset statements. In addition, NAMA case managers identify debtor assets that may be available as additional security. Rental income from investment assets controlled by the debtor must be brought within NAMA's control or visibility. Rents are lodged to bank accounts over which NAMA has imposed security arrangements which preclude the release of funds. Where there is surplus cash available, it is netted against a debtor's loan obligations. Where appropriate, a debtor is required to sell shares, works of art and other non-property assets and apply such disposal proceeds against his NAMA debt. In certain cases, NAMA provides funding which enables viable projects to be sustained and brought to completion with the view to increasing the long-term recoverable value of the assets. It became evident to NAMA following its acquisition of loans, that there was significant and widespread leakage of funds - most notably rental income - which should properly have been applied by debtors towards debt repayment. NAMA set out to address this leakage as a major priority by imposing a requirement that debtors mandate rental income to secured bank accounts. In some cases, NAMA permits an agreed level of overheads and vouched third party costs to be retained or released from these accounts on a periodic basis. NAMA has increased control from 20% of income on acquisition to almost 100% visibility and control at end-2013. This process has ensured that there is much better visibility and control of rental income and outgoings than was in place prior to NAMA's acquisition of loans. Rental income has become a significant and recurring source of revenue for NAMA. In many cases, NAMA insists that a financial monitor and/or collection agent is appointed by the debtor with a duty of care to NAMA to ensure proper oversight and the provision to NAMA of accurate and timely management information. Where a consensual approach is not viable, NAMA exercises such enforcement options as are open to it. An enforcement strategy is pursued by NAMA in circumstances where the debtor's business plan is not considered acceptable, the debtor is in default, the debtor is not cooperating or where some other event has occurred that could potentially threaten NAMA's position as a creditor. By end-December 2013, it had been necessary to make 366 insolvency appointments relating to 285 debtor connections out of the 780 debtor connections whose loans were originally acquired. The enforcement process may apply to part of a debtor connection but not necessarily to all of it. Excluding extensions to existing enforcements, there were 95 new appointments made in 2013, 25 of them relating to NAMA-managed connections and 70 to PI-managed connections. By end-2013, insolvency practitioners had been discharged in 29 cases as a result of the conclusion of the insolvency process when assets were realised. NAMA has introduced a number of measures designed to reduce the level of insolvency fees from those that have applied historically. These measures include the utilisation of a mini-tender process for particular appointments, the promotion of the concept of the 'fixed charge receiver' in Ireland and seeking competitive fixed fee proposals for insolvency assignments. On its website [www.nama.ie], NAMA publishes a listing of properties that are subject to enforcement action. The enforced property details are updated on a monthly basis. At end-December 2013, there were over 2,200 properties or groups of properties listed on the site. In the majority of cases, the properties are available for sale or are under management and generating income. In some instances, insolvency practitioners are working through outstanding title defects, ownership, planning and compliance issues with a view to making the properties available for sale as soon as these issues have been satisfactorily resolved. Based on user feedback, the majority of users of NAMA's enforced properties website are interested in properties that are available within their own geographical areas for rent or purchase. NAMA has, in response to user feedback, significantly enhanced the functionality of the enforced properties website to enable interested parties to interrogate the listing of properties in a much more informative way. In particular, the enhanced functionality includes the facility to search for properties by property type and county/area and includes links, where applicable, to sales brochures. Further enhancements are planned over the course of 2014.